I've got a puzzle for the oft-vocal Apple Fanclub of bloggers and reporters. In June, many of them claimed that Verizon iPhone had stalled Android's US growth and that the days of massive gains were over for Google's mobile platform. How does that reconcile with ComScore's newest smartphone data, released today? At TechCrunch, MG Siegler led the charge in ridiculous late-June post: "The Verizon iPhone Halted Android's Surge. The iPhone 5 Could Reverse It". Other Fanclubbers followed his lead. I rebutted the lot with "Android is unstoppable". The available data didn't support Siegler's assertion then, and even less so today. According to ComScore, for the three months ending June 30, Android smartphone OS market share rose more than 5 percent -- to 40.1 percent from 34.7 percent. By comparison, Apple share rose 1.1 percent to 26.6 percent. Research in Motion and Microsoft platforms lost share -- 3.7 percent and 1.7 percent, respectively. Someone please explain to me what in this data shows "Verizon iPhone halted Android's surge". 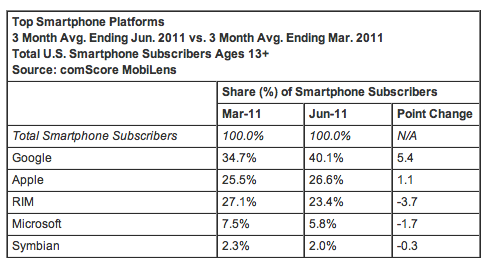 ComScore compiled the data from a sample of 30,000 US mobile subscribers 13 years or older. Two-hundred thirty-four million Americans used cell phones during the three-month period, 78.5 million smartphones. Samsung was top OEM for all handsets with 25.3 percent share. Apple ranked fourth with 8.9 percent share, up just 1 percent year over year. On August 1, Canalys put Android's global smartphone market share at 48 percent, up 379 percent year over year. Android ranks No. 1 in 35 of the 56 countries Canalys tracks. But there's relief for Apple Fanclubbers. last week Strategy Analytics ranked iPhone No. 1 in global market share during second quarter, snatching the ranking from Nokia, which fell to third place behind Samsung. Today, IDC reaffirmed Apple's top ranking but tabulating far different numbers. "The smartphone market crowned a new leader in 2Q 11, and its name is Apple", Ramon Llamas, IDC senior research analyst, says in a statement. "Ever since the first iPhone launched in 2007, Apple has made market-setting strides in hardware, software, and channel development to grab mindshare and market share. Demand has been so strong that even models that have been out for one or two years are still being sought out. With an expected refresh later this year, volumes are set to reach higher levels". Manufacturers shipped 106.5 million smartphones, up 65.4 percent year over year. "The first half of the year has demonstrated strong growth for the smartphone market", Llamas says. "The second half of the year will bring new flagship models and refreshed user experiences to market. These will keep smartphones well out in front of the market, and keep growth on an upward trajectory". IDC forecasts 55 percent year-over-year growth for 2011. Apple shipped 20.3 million handsets during Q2, but IDC's numbers for Samsung are dramatically lower than Strategy Analytics' -- 17.3 million versus 19.2 million, respectively. It's the difference between a close and distant second-place ranking and whether or not Samsung might top Apple during third quarter -- ahead of iPhone 5's launch but during the period when the hot-selling Galaxy S II debuts in China (available now) and the United States (coming soon). "The smartphone market leadership change signifies the parity that comes with a fast-growing market such as smartphones", Kevin Restivo, IDC senior research analyst, says in a statement. "There is no runaway leader in the market, which means there could easily be further Top 5 vendor changes to come". That could mean anything from Samsung toppling Apple to Nokia falling another spot, or something else. One thing is certain: Samsung and HTC both made amazing year-over-year growth gains -- 381 percent and 186 percent, respectively -- mainly because of Android. Right, but that's not possible, because "Verizon iPhone halted Android's surge". Perhaps in an alternate universe.